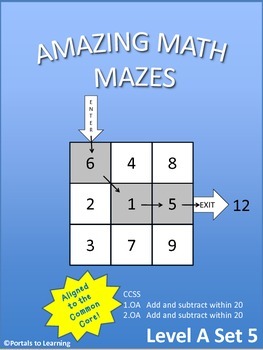 Amazing Math Mazes is an engaging and challenging way to practice adding numbers to 20. Although geared toward the first and second grade standards, this activity is really for anyone who enjoys a challenge. 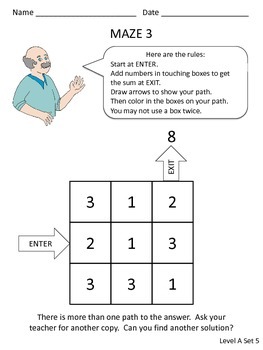 For 3rd grade and up, this activity hones and refines mental addition skills in the context of an enjoyable, motivating puzzle. Each set of mazes includes a week’s worth of fun. Each set involves a slightly greater level of challenge. You and your students will love these daily puzzles. Working alone or with partners, they discover the path to a successful solution. 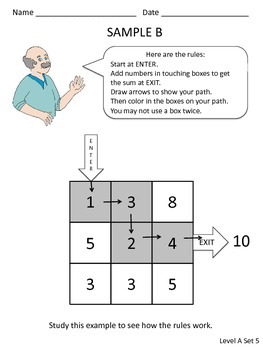 Children enter the maze at the ENTER point and find a path to the solution written at the EXIT point. The squares in their path must be touching. They may show their path by arrows and/or by coloring the squares. Watch their proficiency grow as they wrestle with these challenges and experience the thrill of reaching a solution. The Common Core wants us to emphasize the Mathematical Practices in connection to the content standards. One of these practices is perseverance (Math Practice 1: Make sense of problems and persevere in solving them). With Amazing Math Mazes, children are practicing addition in the context of a nonword problem. They must persevere to solve them. They must practice flexible thinking and be willing to approach the problem in different ways. They must also reason abstractly with quantities (Math Practice 2) and justify their solutions (Math Practice 6, Attend to Precision). 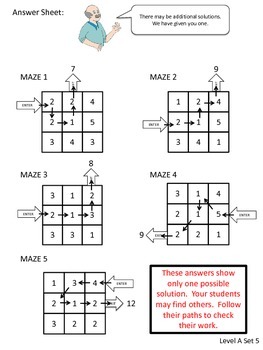 This is the first in our new series of Amazing Math Mazes. Watch for more! Follow us to receive notification of new products as they are created. Portals to Learning is a collaborative team of teacher-colleagues who enjoy working together to design learning for children in the elementary grades. Each of us has different expertise, and we are delighted to share our collective 100+ years of teaching experience with you through TpT. Visit our TpT store to see other products in this series, and in other learning areas. Be sure to FOLLOW US to receive notification of more fraction products as they are created. To follow us, click on the star by our name and photo on the right above, or at our TpT Store. Copyright ©Portals to Learning. All rights reserved by authors. This product is to be used by the original downloader only. Copying for more than one teacher, classroom, department, school, or school system is prohibited. This product may not be distributed or displayed digitally for public view. Failure to comply is a copyright infringement and a violation of the Digital Millennium Copyright Act (DMCA). Clipart and elements found in this PDF are copyrighted and cannot be extracted and used outside of this file without permission or license. Intended for classroom and personal use ONLY.